April is one of my favorite months of the school year because of Poetry Month. 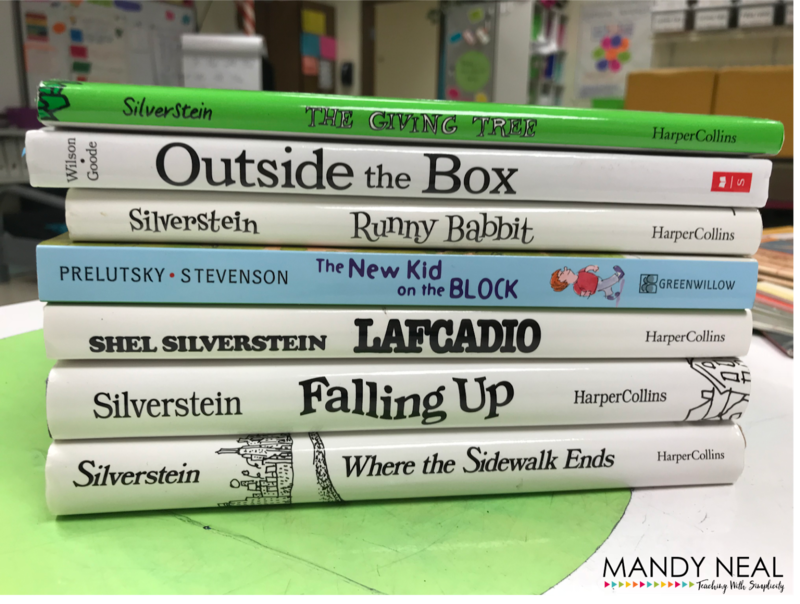 It's fun to write, fun to read, and the students enjoy all of it! 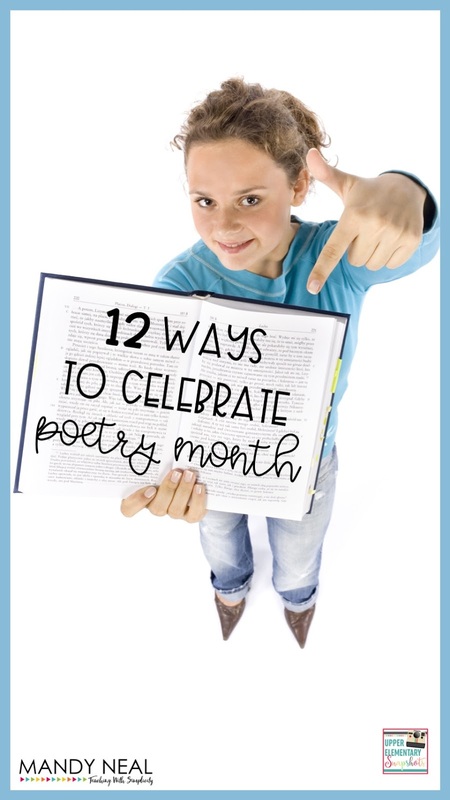 Below you will find a list of activities that are perfect for celebrating Poetry Month. 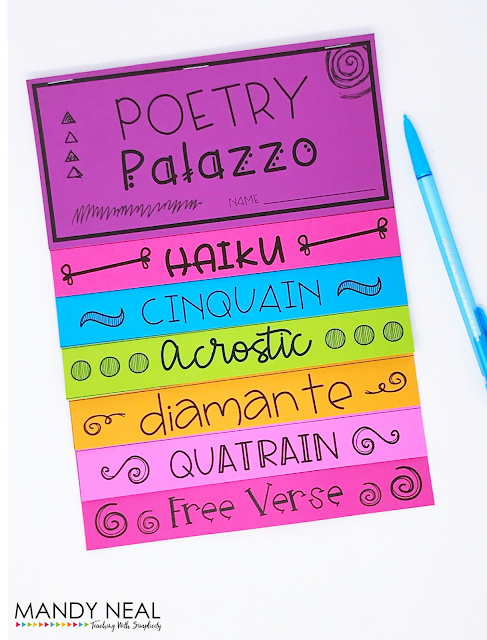 With students, study the different types of poetry and create a poetry flip book that students can use as a reference throughout the month. Find the poetry flip book HERE. Using construction paper or cardstock for a cover, have students create a poetry book in which they spend the entire month of April writing and illustrating poems. We obviously aren't in school all 30 days, so you could double up some days or even assign for weekend homework. After studying types of poetry, pair students up to write a collaborative poem. They could collaborate in writing the poem from beginning to end, or one students writes a line then passes it to their partner to write the next line. Give students a collection of random words. Any number will do, but 5-10 is a good working amount. Once you have given students the list of words, have them write a poem based on guidelines that you have provided. Did you know that there is a Poem in Your Pocket Day? It's observed on April 24. It's the day where you simply choose a poem and keep it in your pocket all day! Throughout the day, you could have students periodically take out their poem and read it to a friend. You can learn more about Poem in Your Pocket Day here. After students have compiled their own writing collection of poetry, invite families or another classroom to visit your classroom so that students can share their work. Make it special by having drinks and a small snack. 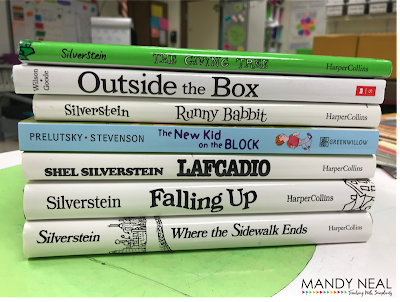 Shel Silverstein and Jack Prelutsky are definitely among my favorite poets, and the students love them! Schedule a time every day during the month of April to read aloud at least one poem. Have students invent their own type of poetry and name it. For example, a Haiku is a three lined poem that follows the syllable pattern 5-7-5. Students could create a poem that followed their own syllable pattern of 3-5-3-3 and give it a name. Who knows, they may become famous someday! This one is so exciting for students. I've done it for several years, and it has been quite successful! Youngpoets.org is an organization that takes students' poetry submissions, they review them, and select the best poems for publication. I always have students that have been selected to be a part of the publication. When the book has been published, the teacher receives a free copy. Students may choose to purchase a book of their own, but are not obligated to do so. It's always fun to see the poems in an actual published book! 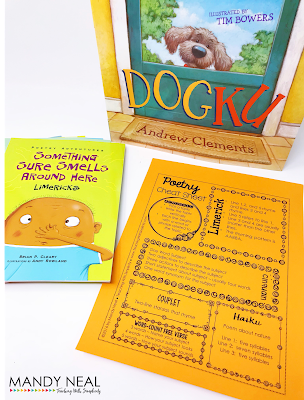 Have students find their favorite poem and read it to the class. The library is always a great place to find a collection of poetry books, but there are a lot of online places to find them as well. Epic is a free digital library with a great collection of poetry books! Have students find a poem of their choice and with a partner or alone have students create a skit. To culminate the creating of a skit, record it to share or have another class come and watch it. 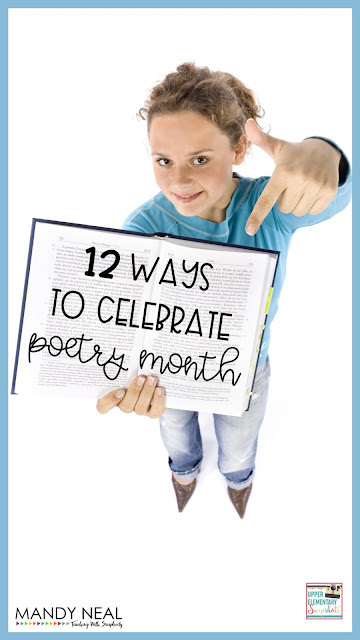 After spending the month of April writing poems, have students pick their favorite poem, and compile a classroom book of poetry. Make a copy for each student as a keepsake. You can grab the poetry cheat sheet shown in the picture below in the Upper Elementary Snapshots collaborative ebook for writing. While you're there, you can check out the other ebooks as well. Find them HERE. As we all know, figurative language is a huge part of poetry. 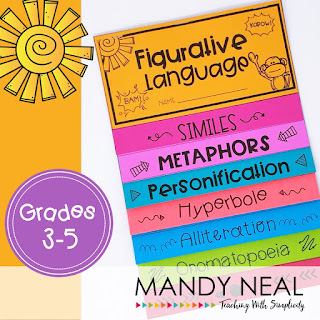 You can tie in figurative language by creating this figurative language flip book. You can find it HERE.